DSM Dyneema is the inventor and manufacturer of ultra high molecular weight polyethylene (UHMWPE), branded as Dyneema®, the world’s strongest fiber™. Dyneema is an ultra strong, polyethylene fibre, which has an ever-increasing range of uses in the high-performance, demanding life protection sector. Dyneema offers maximum strength at minimum weight. On a weight-for-weight basis, Dyneema is up to 15 times stronger than quality steel and up to 40% stronger than aramid fibres. Key applications for Dyneema include: bullet-resistant vests, inserts, helmets and anti-ballistic protection for military and police vehicles. Products made with Dyneema are proven in action and provide protection in areas of conflict worldwide. End-users include the military, law enforcement and civil protection. As well as being ultra-light, extremely strong and durable, Dyneema fibres are resistant to moisture, UV rays and most chemicals, such as sweat and common cleaning solvents. The material floats on water and has a low specific gravity of 0.97g/cm³. This means that pressed hard armour panels made of this material have the same characteristics. Dyneema is easy to handle, which has an added advantage of reducing time and costs for body armour manufacturers in material lay-up and cutting. 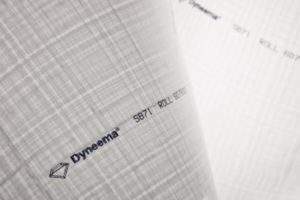 Dyneema grades have been developed for soft and hard ballistic applications. Soft ballistic systems (SB) are designed specifically for use in vests to provide protection against handgun ammunitions and fragments, as well as combined threats, such as knives. Hard ballistic grades (HB) are specified for ballistic inserts and helmets to protect against heavier, more penetrating threats such as high-speed fragments and rifle threats. 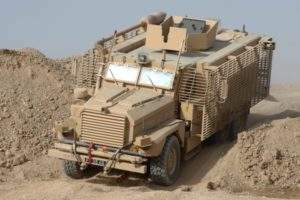 Dyneema has been used in numerous vehicles and body armour products, including vests, helmets and inserts, by a rapidly growing number of end-users. Ultra-strong Dyneema UD composite HB80 was originally launched in response to a joint US Army and Marine Corps request for a new material that would increase the ballistic performance of the next generation helmet, enhanced combat helmet (ECH), without increasing the weight. DSM Dyneema was also asked to make a 35% improvement on the current specifications for fragments (FSP and RCC). A key application of Dyneema HB80 is a ballistic combat helmet called the FAST (future assault shell technology) helmet. 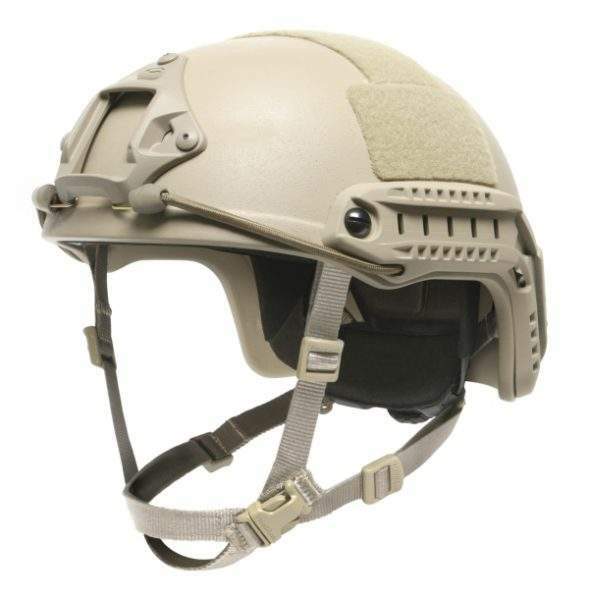 Introduced by Ops-Core of Boston, US, the FAST helmet has been a favourite of special operations forces around the world for several years now. It is already used by many elite units in the US, as well as top tier programmes in other European countries. High-performance Dyneema SB71 by DSM Dyneema was specifically designed and developed for use in ballistic vests certified under NIJ0101.06. SB71 facilitates protective concepts for the lightest, most comfortable and most demanding vest applications. It is suited for vest designs that meet the NIJ06 standard, as well as other law enforcement and military standards. Where all the other Dyneema UD grade-based solutions are already lighter than other non-PE vest solutions, SB71 offers an average of 15% in weight saving. SB71, which can be used to design vests meeting NIJ06 specification, was developed in close cooperation with body armour manufacturers. The main advantages of SB71 include reductions in costs, time and material. Ease of handling leads to time and cost reductions, with a decrease in time spent in material lay-up and cutting. And with less material required, the environmental benefits are also significant. Throughout the wide range of armour applications, Dyneema UD has been well recognised by various defence forces around the world. Dyneema UD offers a combination of exceptional strength with very low weight, which allows designers to add extra protection with minimal additional weight by using the material as the backing for the ceramic insert. The Dyneema UD backing not only increases the vest’s resistance to ballistic impact, but also helps protect the wearer against wounds in the event of the ceramic shattering. 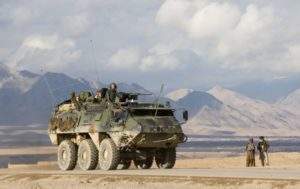 Dyneema is a key ingredient in armour solutions that increase crew survivability, while at the same time creating room for further weight growth of the vehicle, as modern warfare dictates. DSM Dyneema’s proprietary ballistic tape BT10 can be applied as a backing material for strike force armour. The material has been tested and certified according to NATO standard, STANAG 4569 and by AEP55. Vehicle protection applications that use Dyneema hard ballistic solutions benefit from its unique combination of light weight materials and exceptional protective ability. This enables vehicles to have increased vehicle performance, increased payloads and to reduce the total cost of ownership, while being ensured of retained armour performance in harsh environments. DSM Dyneema has its own well-equipped testing facilities and is always looking into material improvements and application developments in collaboration with different institutes, customers and end users. DSM Dyneema, the inventor and manufacturer of ultra-high molecular weight polyethylene (UHMWPE) fiber branded as Dyneema®, officially opened its new Asia Pacific Technical Center in Singapore today. In this study we focused on the residual ballistic performance of ballistic articles based on Dyneema Ultrahigh Molecular Weight Polyethylene (UHMW-PE) subjected to real aging and use. DSM Dyneema, the producer of UHMwPE fiber and UD, branded Dyneema, has recently finished two projects to study the long-term ballistic properties of various elements of personal protection equipment, intended for use by law enforcement and military personnel, made with its Dyneema UD unidirectional composite. The performance of armor based on Ultra High Molecular Weight Poly-Ethylene (UHMW-PE) fiber at elevated temperatures has been studied. DSM Dyneema has released a white paper highlighting real aging on ballistic articles. Applications made with ultrahigh molecular weight polyethylene (UHMwPE) fiber and unidirectional (UD) retain a very high level of ballistic protection after real-time aging and use in the field, a new study shows. Latest innovations with Dyneema, made by customers in protective equipment for law enforcement personnel will be on display on the DSM Dyneema stand B43 at GPEC 2012, the seventh General Police Equipment Exhibition & Conference taking place in Leipzig on 11-13th September. At Eurosatory 2012, which will be held in Paris from 11-15 June, DSM Dyneema will be showcasing its recent developments in ultra-high molecular weight polyethylene (UHMWPE) technology. DSM Dyneema has announced several important new accomplishments at its ultra high molecular weight polyethylene (UHMWPE) materials manufacturing facility (Greenville, North Carolina, US) that underscore the company's growing global position as a leading supplier of advanced materials solutions for the life protection industry. DSM Dyneema today announced that its Dyneema HB80 unidirectional (UD) composite, one of the highest ballistic performance UD materials on the market today, played a critical role in Ceradyne's successful development of the new Enhanced Combat Helmet (ECH) for the US Marine Corps and Army.